If you’re a stomach sleeper than the Comfort Gel mattress has your name on it! You get full support in all the right areas, contouring your body where you need it. The 10” foam mattress is constructed in two layers. The top layer is made with a 2” gel viscos which keeps your body cool and 8” of foam for support. It’s wrapped with a fire barrier sock and topped with a soft stretch knit fabric. Temperature Regulating System The 2” gel viscos has multiple purposes one of them is to help you sleep cooler. Gel beads are infused into the memory foam. The aerated structure provides better air circulation and allows heat to escape from the mattress more efficiently. Memory Foam Outside of temperature regulation, the gel viscos also assists with targeted support. When compressed the gel beads come together to provide targeted support such as under the hips and shoulders. 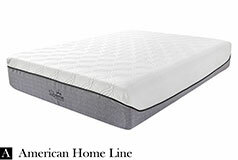 Memory foam contours the body and you’ll fell like you’re sleeping in your mattress versus sleep on top of your mattress like a traditional mattress. Support Foam The support layer is made with 8” of high density foam. It’s durable and it holds it form for many years to come. It helps with pressure relief and it minimizes motion transfer. Dimensions Mattress: 76" x 80" X 10"
2in1 Bed & Box spring: 76" x 80" X 8"
Packaging Bed-in-a-Box. For convenience, this mattress is compressed and rolled in a box so that is easily shipped and set up in any home! Easily moved into any room without difficulty, fits easily around tight corners and upstairs. 2-in-1 Bed and Box Spring Description: The 2-in-1 Bed and Box Spring solves all your problems! It’s a collapsible, metal frame based that comes in two sizes — queen and king. It's easily modified by attaching the legs and using as a bed or remove the legs and place on top on a metal rail frame like a boxspring. Unlike traditional wooden boxsprings, the 2-in-1 Bed can easily be assembled. You don’t need to worry about trying to squeeze it up stairwells and jamming it through the doorframe. The metal boxspring is much more maneuverable. Its metal constructions mean it won't break down over time. It won't become brittle and create uneven sections of support causing your mattress to sag, unlike the wooden boxspring. That way you maintain an even and supportive sleeping foundation. And since the metal boxspring won't break down over time, you won't hear those creaky noises in your bed cause by the wooden boxspring's reduction in quality of materials. The wooden slats can break without warning and unless you physically check the base itself, you are not aware until you notice that the quality of sleep is diminished, or the noise levels reach new heights. Once assembled, all you need to do is place the fire-resistant cover over your foundation. Simply slide your mattress on top. With the 2-in-1 Bed and Box Spring you’ll minimize sagging and extend the life of your mattress. 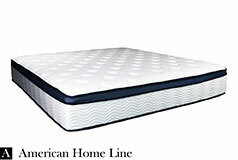 Package includes: Comfort Gel 10" King Mattress, 2in1 Beframe Cover-King, 2in1 Bed & Box Spring for King.